Find out the process one vendor went through in getting its EHR MU certified as well as what the stage 1 requirements mean for radiologists. From pediatricians and podiatrists to hospital chief information officers and orthopedists, meaningful use is on the tips of most healthcare professionals’ tongues as of late, and radiologists are no exception. But because the federal regulations establishing criteria for the “meaningful use” of EHRs were written to a broad, general audience of “eligible professionals” and “eligible hospitals,” imaging organizations and radiologists are now left to figure out how the one-size-fits-all guidelines fit into their day-to-day workflow. As of now, many radiologists have chosen to wait and see what EHR products come to market and how other radiologists implement them. There’s only so much time for waiting, however, as reimbursements will be dropped starting in 2015 for those healthcare professionals who haven’t yet become meaningful users. Radiologists aren’t the only ones left partly in the dark—vendors have also been left to determine their own best way forward in devising EHRs that can be used by various specialties to adequately demonstrate meaningful use (regulations that themselves could change with one word from the Centers for Medicare & Medicaid Services [CMS]) while not inundating doctors with workflow inefficiencies. To get a better idea of what meaningful use looks like, Radiology Today asked Integrated Document Solutions (IDS) to give us a peek into the process involved in certifying its EHR as well as what that means for radiologists in the way of workflow and other changes. IDS’ cloud-based product, AbbaDox EHR 8.0, was certified by the Drummond Group as a complete ambulatory EHR in mid-February. Federal meaningful use regulations for stage 1 were finalized in July 2010. Roughly six months later, according to IDS President Yaniv Dagan, the company first considered jumping into the certification game, at which time “we had created a road map for our development team, which included EHR certification. We decided in June of that year to make the commitment to move forward,” he explains. So where did IDS start? Once the official decision was made to go after EHR certification, Dagan says IDS’ developers initially performed a thorough review of its systems and compared the resulting information with the stage 1 requirements. “After that, we did a second review but this time much more detailed so we could specifically identify what needed to be modified or added to achieve certification,” he says, noting that this review process took the better of two months. “We invested a lot of time into analyzing the certification requirements and performing a review of systems to quantify what we already had in place vs. the additional functionality that needed to be developed,” adds Dagan. A significant amount of the stage 1 requirements were already incorporated into AbbaDox: functionalities relating to security protocols, system auditing, e-prescribing, patient demographic fields, and patient charting as well as a physician portal. Most of what the developers had to add into the EHR related to specific alerts and reporting tools necessary to achieve meaningful use. After the initial review was completed came the refinement stage, in which IDS scrutinized just how the added functionalities and requirements of meaningful use would affect real-life workflow for users. IDS knew that a certified EHR wouldn’t be worth much to physicians if it couldn’t promise a common-sense workflow, so they carried out in-house mock-ups to find the workflow flaws. As IDS’ development team was assigned specific tasks and deadlines, the AbbaDox EHR started to come together. One task evident in each and every step? Testing. Final testing for certification took an entire day, during which IDS sequestered its EHR team away from the rest of the company. “We had all of our information printed and ready to pull up on a moment’s notice and even hung a giant blueprint on the wall for quick reference,” she says. IDS managed the certification test through the teleconferencing service GoToMeeting, going through a proctor who would test how the EHR addressed each meaningful use requirement. The proctor took note of all steps involved and asked the design team questions about their overall approach to each criterion. “We knew the sequence of testing, so we prepared for the next test while the current criterion was under review,” she says. Now that the AbbaDox EHR has officially been certified for meaningful use, the testing is over—at least for IDS. Now it’s time for healthcare facilities to take over in their real-world implementation. So what differences should IDS customers expect between AbbaDox EHR and the existing version of AbbaDox? Also added into the EHR were the ability to track historical patient vitals and a more detailed order entry interface. “We also needed to set up a system for alerting doctors of critical patient status,” he says. “Our EHR also provides a patient portal, which is part of the meaningful use requirements,” Dagan adds, noting it as something that may be less commonly utilized by radiologists. “It’s something typically outside of the radiology workflow, but it does need to be accounted for,” he says. Overall, he says any changes required by current customers who want to implement the EHR version are minimal. “We’re taking all the accumulated historical data and applying it to the EHR in a structured way so that the group can use it for meaningful use reporting,” he says. For customers using IDS’ speech recognition technology, the EHR can also take some visit data, such as vital signs and other patient information, from the dictations and automatically populate it into the EHR, says Dagan. In summary, there are a total of 25 meaningful use objectives. Fifteen are part of the mandatory core set (including e-prescribing, drug interaction checks, and the recording of vital signs). Eligible professionals must then choose five objectives from a menu set list to make it to 20—the menu set objectives involve patient reminders, clinical lab test results, and drug formulary checks. However, radiologists can claim exclusion from certain core and menu set objectives due to relevancy, and the CMS will count those exclusions as satisfying the objective, says Dagan. Lastly, eligible professionals must also be able to report on clinical quality measures through their EHR. • low back pain: use of imaging studies (percentage of patients with primary diagnosis of low back pain who did not have an imaging study within 28 days of diagnosis). As most of the stage 1 measures relate to capturing additional patient visit information and reporting on certain metrics, Dagan expects much—if not all—of the workflow changes necessary for demonstrating meaningful use to be done by back-office staff, not radiologists themselves. 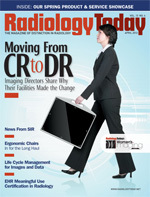 “For radiology, this means recording patient information, such as vital signs and demographics and coding information, but these things are more on the back-office side,” he says, noting that the meaningful use reporting requirements are also completed by back-office staff rather than radiologists themselves. Dagan notes that while he wouldn’t call AbbaDox a radiology-specific EHR (because most of the government’s stage 1 requirements weren’t targeted toward radiology), he says its functionalities still fit into radiology workflow, be it radiologists or teleradiologists. “AbbaDox has a complete digital patient chart—with all the required security preferences and audit trails—that stores all current and historical clinical data, including final reports, DICOM images, and scanned documents,” he explains. “Also, because we have access to the actual final reports, we built the capability to restructure this data and mine it for meaningful use reporting, thereby providing flexibility to make it more relevant to radiology. All this information is then fed into a referring physician portal, which allows for the easy distribution of study results to referring doctors. “Because it’s all in the cloud, the referring physicians don’t need to install additional applications, and the facility’s IT staff doesn’t have to maintain VPN [virtual private network] connections,” says Dagan. The CMS released the proposed rule for stage 2 requirements in late February and though nothing’s set in stone, imaging seems to play a bigger role in these guidelines, which addressed access to imaging results and information. IDS is currently in the early stages of evaluating what stage 2 means for the company, but for radiologists, today is about conquering stage 1. Noting the broad nature of the stage 1 guidelines, Dagan says his most pertinent piece of advice for radiologists attempting to meet meaningful use is to make sure they can customize whatever certified EHR to their own needs.